Jeopardy is most likely the most recognisable game show in America and is not yours to play once more in the form of a multi-line video slot. 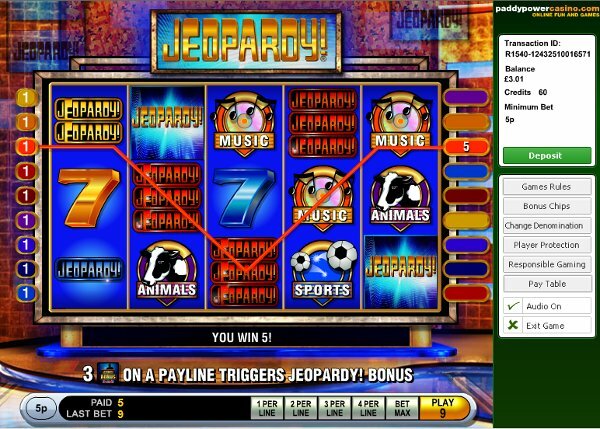 Created by IGT jeopardy features all the thrills and spills you would expect form a game and even features originals sound effects and side games. This vivid 5-reel, 9-payline slot is brimming with action from start to finish, with the end prize coming in at a whopping 25,000 coins. The small payline structure in addition to this mammoth top prize makes it a brilliant game for players of all bank rolls. The most notable part of the slot is the way in which the game has been designed. The developers have ensured none of the ‘panache’ has been lost in translation, with the reels sparkling with seemingly every colour imaginable. The dated look isn’t lost either, giving players the chance to get stuck into a truly authentic replica of this hit game show. The fast gameplay the game offers is very fast, making the transitions between wins, spins and features rather neat, and no time is spent with annoying sub plots. This game gets straight to it. The first symbol players should look out for is the Double Jeopardy Wild icon. This lucrative symbol will substitute for any other symbol with the game (except the bonus round icon), making the task of hitting a winning line a lot easier. In addition to this every winning line that utilises this symbol will be doubled also! The one and only bonus feature is activated by spinning 3 or more Jeopardy bonus symbols on an active payline and once triggered, the lights will intensify, the backdrop will darken it is now your time to take on the Jeopardy game! Just like the game show players are asked to choose from an array of hidden prizes behind the grid. The aim of the game is to avoid the ‘double jeopardy’ logo as much as possible whilst reaping the multipliers and cash prizes. If you are unfortunate to select the ‘double Jeopardy’ logo this part of the game is over, and all wins will be accumulated and taken directly to the next part of the game. Here players are confronted by essentially a glorified gamble round: featuring 3 contestants all waiting to give a ‘correct’ or ‘wrong’ answer. Players can choose whether to wager a half or a quarter of the current total, remembering that it is not compulsory and at any time this round can be dismissed. With an average house edge of just over 6% the game offers much more than a just a huge top prize and exciting bonus features. Slot and game show fans alike will enjoy this excellent IGT creation, available to play at all casinos that are sponsored by this established developer.